Here at Currie we use our blog to write about the stuff we like. Gabrielle recently wrote about the biggest storm ever as she headed back to the Philippines. Mark often writes about leadership, Fiona is our wordsmith and Susan our communicator. Katrina loves to talk green and Craig, anything about US politics suits him. Me? As the latest addition to Team Currie I like to talk about language. What are the words we use in marketing and communication? Words such as stakeholders, engagement and networking really grate on me. I prefer to talk of the people we connect with, our relationships with them, and the people who are important to our business. Last year I was invited to a deep dinner. The purpose of a deep dinner is to break bread and drink wine around the kitchen table to discuss – make-comment – and take action on something passionate. The deep dinner I attended (armed with family wine and macarons) was marketing: specifically, “the sick language of marketing“. My friend and advocate Carolyn Tate took to the head of the table. We talked bad marketing and great marketing. We shared stories of awesome customer service here in Australia and the United States. And importantly we committed to change. This change will not save the world – it will not feed it, water it or make it safer. However my commitment to change means I use words that everyone can connect to. I speak with people (not business to business) and I work with great products and services (no more crap in this world). And through this change my immediate world has become a better place. 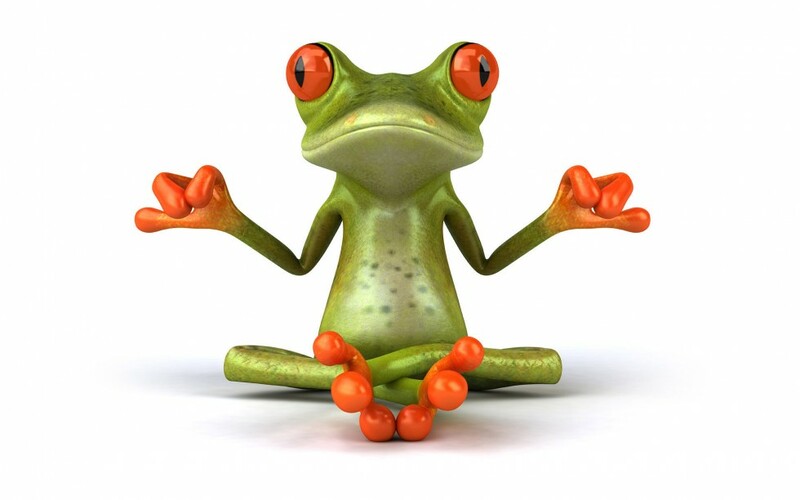 I have a thing for green frogs (hence my yogic green frog above). It all started a few years back when I learnt that if you eat a live green frog first thing in the morning, the day can only get better – I’d had a particularly rough morning involving a jay-walking ticket. Whilst the closest I have come to eating a green frog (other than a distant childhood memory) is the jelly cousin to the red frog, I do start my day with the toughest of tasks which logically means the rest is easy! Some people attribute the green frog phenomenon to Mark Twain, but I think he nabbed it from his neighbour Harriet Stowe.